Arizona leading real estate company, Level 4 Funding LLC, is today predicting the Wild West Phoenix real estate business is heading for what it is calling a “New Boom Time”. According to the real estate experts, this boom is going to be different from the boom, fueled on greed of the consumer, but this time it will be a supply problem. “With low inventory and too many buyers, the housing experts believe the Phoenix Real Estate Market is on the verge of a new boom in real estate values,” predicts Dennis Dahlberg, Level 4 Funding’s General Manager, Private Hard Money Lender with many years of flipping and fixing real estate experience. According to Dahlberg, there has been little or no construction or movement of dirt thus leaving the Phoenix housing market starving for new homes. Besides, he argues home values are rising dramatically, and once the current home owners get above water (have equity), they are going to want to move up. “We're going to have a trifecta or the perfect storm - no homes, pent-up demand, and record low interest rates. Besides, if a little inflation is thrown into the mix - watch out! Bam! It’s going to be a wild ride - a Wild West ride,” states Dahlberg, who is basing his prediction on data provided by S&P/Case Shiller. According to the S&P/Case Shiller’s data, the bottom is over and the market is moving up again and this time it's going to be even bigger. 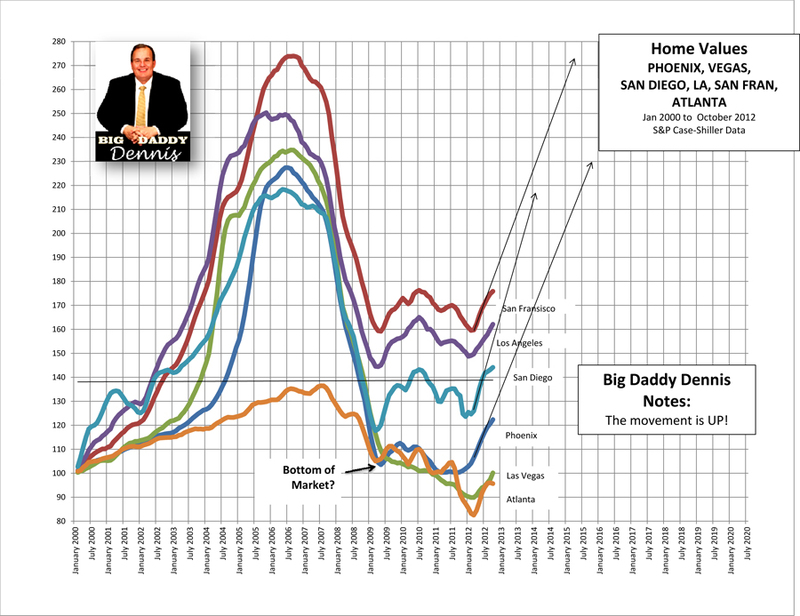 Home values will not return to the trend line for another 1-2 years. Latest trend shows Phoenix back to the highs starting July 2014. The upturn in values is due to lack of inventory and record low interest rates. Keep the home if possible. Do whatever it takes to keep the current home. Do a loan modification? HAPR 2. It’s possible but there are very few who are successful. Bailing out and letting the bank foreclose will make it harder to buy a home within the next 5-7 years, maybe even never again. The amount of debt in the USA will continue to grow. The amount is very frightening. At this rate, in 5-7 years, it will cost $10 to buy a loaf of bread. Gasoline will cost $25/gallon. And the average starter home price will be $600,000. Get out of debt; get rid of the credit cards and pay them off. Purchase only with cash. Do not get into any debt. Start a side business. It’s too difficult to explain why here, but the best reason is the potential tax advantage and the possible income. Doing a side business is the last area the government has yet to attack. Make it simple and get going. An extra $400 per month really helps. If at all possible, buy only quality single family homes in a good area and turn them into rental units. “I've talked to a lot of people who feel that they can ‘let their home go and rent for awhile’. Rental rates are lower than their mortgage rates, but persons can save a lot of money by renting vs. paying the mortgage, and in two years,” says Dahlberg. However, Dahlberg points out that, “It’s actually going to be 5-7 years before your credit report looks good enough to purchase a home again. And can you really save the money? Most people will spend the money on toys. If hyper-inflation hits, like some economists predict, then you’ll be priced out of the market. Do you want to take the chance? If possible, keep the home and do a HARP 2 loan modification, and hang on… the next 5-7 years are going to be enjoyable."